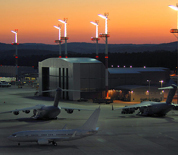 Ramstein AB is located in Kaiserslautern, Germany and is part of the massive Kaiserslautern Military Community. It is the headquarters of the US Air Forces in Europe. As a NATO installation, personnel from multiple nations work at Ramstein although the host wing, the 86th Airlift Wing, belongs to the USAF. The mission on base is maintain approximately 220 aircraft to conduct a wide range of operations throughout Europe, Africa and the Middle East. Ramstein recently experienced major renovations leaving the support facilities on base abundant and modern. The new Ramstein Passenger Terminal is a popular entry point for Space A travelers visiting Europe. This Ramstein Air Base directory features the critical info you’ll need to navigate through the many facilities and recreational opportunities available on base­­.